Home Blog What to do when marketing budget is not enough on your dental practice? 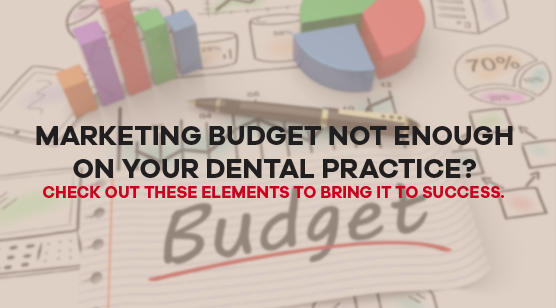 What to do when marketing budget is not enough on your dental practice? In the dental marketing industry, there is no such thing as ‘not enough’. It’s all about being a smart marketer. They are the kind of people who know how to take advantage when the budget is smaller than usual. But again, it’s not all about the size, nor is it about following the latest trends. Putting up a dental practice requires these three elements to bring it to success. So, here are the 3 main ingredients for your dental practice. Even if your budget is limited, it is important to have a tracking system in order to have an idea whether or not your practice isn’t performing. There are different ways to do so. Believe it or not, this would simply cost you a small amount. Setting up multiple numbers which can all be channeled to different lines such as postcards, website, and even pay-per-click campaign. All you need is to do is to train your hired front desk staff. This means, you don’t need to hire another one to keep track on your clinic. It wouldn’t take much effort to ask your patients (new or old) how did they found out about your business. Google analytics is a tracking system where you do not need to spend a penny on. In other words, this is 100% free to any marketer, yet the services it provides is insane. For example, you will be able to recognize your user’s behavior, how they react, what pages they visit, and more. Keep in mind that your patients are the lifeblood of your business. Because of this, it is important to train your front desk staff in the path where you are both going. The moment you ask a new lead how they learned about your practice, you have already made a big leap. Let’s take it to a real situation where this new patient, a potential loyal patient, simply says that he has found your practice online. A bad staff would simply smile and forget it. On the other hand, a good member of your staff would be asking for more questions to make it more specific. Perhaps this is true in almost all of your tasks where you need to keep a new patient’s number and make a follow-up. Unlike other marketers, a dental practice broker needs to take advantage of a tool that will increase your revenue and take the lead in the industry. Once you take advantage of this, you can determine how much you are spending and begin to create a plan for the entire year. Bottomline is, you don’t need to have a large amount of money to start a dental practice, rather, all you need is to be smart and take advantage of these three ingredients for a practice to take the lead.